Accepts hose sizes, 12.5mm, 20mm, 25mm. Trim to the required size. 1.25" Male thread. Accepts hose sizes, 20mm, 25mm, 32mm. Trim to the required size. 1.5" Male thread. 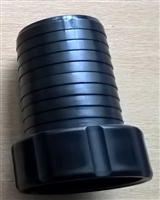 Accepts hose sizes, 20mm, 25mm, 32mm, 38mm. Accepts hose sizes, 25mm, 32mm, 38mm. Trim to the required size 2" Male thread. For smooth adjustment of the water flow, equipped with 2 multistage hosetails for hose sizes of 1” to 1 1/2”. 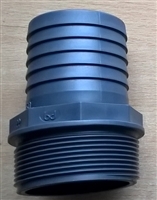 Versatile fitting takes up to 2" hose on a unique swivel inlet. Two valved outlets up to 1.5" enables flow control to two outlets. Tradux enables a wall transition below the water surface in order to hide cables or hoses. Pumps, filters, and lights are invisibly supplied with power and hoses; forget the bothersome attempts to conceal connections that run over the edge of the pond.